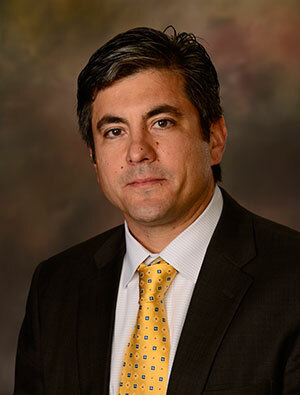 About | Andres Carrano, Ph.D.
Dr. Andres Carrano is the Associate Dean for Research in the Allen E. Paulson College of Engineering and Computing at Georgia Southern University and a professor in the Department of Manufacturing Engineering. Previously, he held the Philpott-WestPoint Stevens professorship in the Department of Industrial and Systems Engineering at Auburn University. While at Auburn University, he founded and co-directed the 3D Printed Bio-Surfaces Laboratory and the International Research Group in Sustainable Pallets. Between 2000-2013, he served on the faculty of the Kate Gleason College of Engineering at the Rochester Institute of Technology in New York. At RIT, he founded the Toyota Production Systems Laboratory and served as its director for over a decade; a period in which it grew into a nationally-recognized award winning facility. He was also instrumental in the development and delivery of the Master program in Sustainable Engineering at RIT, the first of its kind in the U.S. Before that, he served for two years on the faculty at the Universidad Catolica Andres Bello in Venezuela. Dr. Carrano has held formal faculty appointments at universities in Japan, Turkey, USA and Venezuela and was awarded a NASA Fellow appointment at the Marshall Space Flight Center (2016). He has also served as a Fulbright scholar in Italy (2018) and is the recipient of the Outstanding Teaching Award at Auburn University (2014), UPS Minority Award (2013), IIE Curriculum Innovations Award (2009), IIE Lean Teaching Award (2010) and EPA P3 Prize Award (2005 and 2016). While a student at NC State University, he was inducted into the Honor Society of Phi Kappa Phi (1998). He earned his PhD. and M.Sc. degrees from the Fitts Department of Industrial and Systems Engineering at North Carolina State University and his B.S. degree from Universidad Catolica Andres Bello (Venezuela). He served as the President of the College Industry Council in Material Handling Education (CICMHE) during 2014-2015 and is a senior member of IIE, SME and ASEE.